Buddhist Manuscript Cultures explores how religious and cultural practices in premodern Asia were shaped by literary and artistic traditions as well as by Buddhist material culture. This study of Buddhist texts focuses on the significance of their material forms rather than their doctrinal contents, and examines how and why they were made. 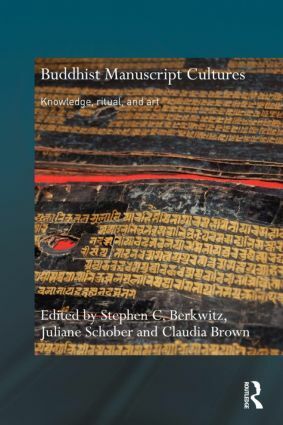 Collectively, the book offers cross-cultural and comparative insights into the transmission of Buddhist knowledge and the use of texts and images as ritual objects in the artistic and aesthetic traditions of Buddhist cultures. Drawing on case studies from India, Gandhara, Sri Lanka, Thailand, Mongolia, China and Nepal, the chapters included investigate the range of interests and values associated with producing and using written texts, and the roles manuscripts and images play in the transmission of Buddhist texts and in fostering devotion among Buddhist communities. Contributions are by reputed scholars in Buddhist Studies and represent diverse disciplinary approaches from religious studies, art history, anthropology, and history. This book will be of interest to scholars and students working in these fields. Why did the Gandha¯ran Buddhists bury their manuscripts?